At the Integrated Systems Europe 2017 tradeshow we noticed an exhibitor stand with products that seemed to be the next step in business collaboration solutions. Mezzanine, an interesting subject to report about but what caught our eyes even more was the exhibitor name Oblong. We were very curious to find out what this means and got to meet Mary Ann de Lares Norris. 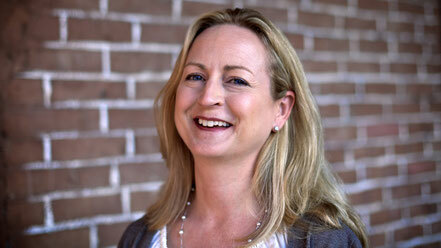 She is ‎VP EMEA at LA based Oblong Industries Inc. and stationed in France. can you explain us what the company name oblong stands for? When we choose the name Oblong we were focusing on choosing something that was durable, lasting and also persistent. Oblong is a shape that exists in nature and we want it to feel like there was permanence in the company that we were creating. At the time we were creating the company, it was all of the rage, the fashion to be something 'tec' or 'dotcom'. In a way we wanted to be also organic, something that exist in nature, being durable and beautiful. Is mezzanine a frontend solution, or does it also have a backend technology? Mezzanine is sold to our customers as an appliance on premises of their company and network. We also sell it with a gestural tracking solution. We have trademarked Mezzanine as the name for our family of products and we have trademarked g-speak, which is the core platform we use to develop all our solutions. You can think of it as an operating system that sits on top of existing operating systems. It is a spatial operating system that allows us to build all of our products and services on operating systems. We also have designed g-speak from the ground up, and again g-speak is a spatial operating system. This is unique and powers the entire Mezzanine family of products and our bespoke solutions that we create for our customers. What is infopresence, and what are the usp's? Infopresence is the term that we have been using to describe the future of work. At Oblong we believe that it is all about a next generation human machine interface that is data centric. The idea is that in today’s world there is so much (unstructured) data, we are going to be living in a world of all data, according to IBM. We need different ways of interacting with that data and we also need different ways to collaborate with that data. Infopresence is the experience of being surrounded by all vital data and content, and being able to manipulate it seamlessly for insights and decisions more quickly than you would in a typical meeting environment. So you gain a lot of time? Yes, faster decision making is one of the key usp’s. Our customers understand that in today’s complex world you have to take into account many different pieces of information and data, to come to the best solution in the moment. So having all that data and information around you and be able to pull up a piece of data using our gestural interaction, pick up that piece and make it large, discuss it, shrink it down, maybe pick up a video feed that is related to the data you were just looking at, being able to watch that feed with our technology you can snapshot frames of that video and save it into your workspace. It is really a flexible way making sense of a lot of data. What can you do with mezzanine in terms of big data and business intelligence? It is used by a number of our customers as a platform for there own big data practices. Accenture for example has a business analysis practice and Mezzanine powers the beating heart of that practice. This is not a data analytics tool, it is a new way for us as humans to interact with our data, it is very human centered next generation interaction and design. Our customers use that next generation HMI as the structure on which they base their own big data practices. So we are not big data analytics experts but we provide a next generation platform for customers. Does mezzanine also have printing solutions? e.g. securely printing legal documents. At the end of a Mezzanine session or entirely during the session, but generally at the end, if the participants of the session want a physical record of what happened in the session they can create a pdf in the workspace that can be downloaded and then printed or archived. oblong also works with young talent, What's so compelling about Los angeles for graduates? 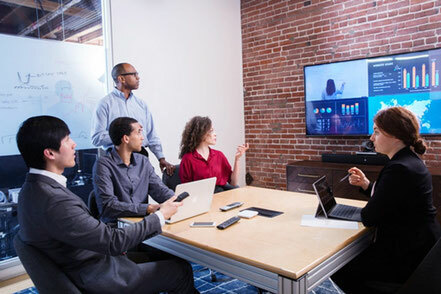 Oblong was founded in Los Angeles, the founders considered that is was a great place for our technology company. There is a tremendous amount of talent in Los Angeles, not only great engineering talent but also design talent. There is a lot of creativity in L.A. and there are some of the best art and design schools. One of the best technological art design programs is out of UCLA. We have drawn a lot of graduates out of UCLA. We also have fantastic traditional engineering schools in the L.A. area, so it is a great place to have a company. Downtown in particular is a great location because you can get to downtown from many different parts of southern California. For employees we are able to draw upon a large sector of southern California, because people can come in by public transportation, on the new metro, the airline and freeways. how did you also end up in France? I ended up in France many years ago when I met the person who is now my husband. He was living in Paris and at that time there were two areas of technologies that were more advanced in France than in the United States. These areas are mobile gaming and interactive television which were related to my career path. I had the opportunity to go to France to both work in the interactive television arena and the local gaming area. So I ended up being a COO of an interactive television software company in Paris and had a really fantastic experience at the same time. My boyfriend became my husband and we raised a family. I have two children, a boy who is ten years old and a girl who is twelve years old. We are already sixteen years together and I love being in France. John Underkoffler is the founding partner of oblong, how did you get to know him? John is first and foremost a polymath. He is brilliant and interested in a lot of different things. That is why he ended up at MIT Media Lab in Cambridge, MA. That is also where I ended up for graduate school. It is a place where computing, publishing and broadcasting come together. You can go there if you are interested in music, architecture, graphic design, language learning, computation and so on. We have all those passions together in a coherent story. That was what John did at MIT and what he is doing at Oblong. That is why we have this mix of beautiful design and incredible technology, both are equally important to us. And to just have incredible technology is not enough, it is not what inspires us the most. What really inspires us is making beautiful lasting contributions to how we interact with our computers every day. This is also a reason why he became advisor for movie productions like Minority Report, Iron Man and the Hulk!...he is very passionate about movies and film. What about UI gesture in minority report? Will this be the next big thing in years to come? I would argue that we have what you saw in Minority Report today and we are selling it to large companies. However our customers do not put gloves on but put a wand in their hand. That wand is a pointing device and it gives you gestural control of all of your data in the same way that people remember Tom Cruise in the movie Minority Report. What do all or most of Oblong customers have in common? I would say that our customers recognize the fact that it is a strategic imperative to adopt new working methods to their organizations. It is a competitive advantage. All of our customers almost across the board, are top in their class. You do not stay top of your class as a company, unless you keep innovating and you keep pushing the boundaries, adopting new things and really embracing change. I would say that is the unifying element of all our customers. Oblong has amazing customers like nasa, ibm, accenture, pwc, what do you think about that? Yes and Fujitsu is also a customer. They actually are using our system as an innovation platform to connect their executives in Tokyo and their teams in Silicon Valley. There are a lot of customers that we cannot talk about publicly. What you see on our website is just a small sample of the entire universe of customers that we have. We are very proud of that. Absolutely, there is nothing better than commercial validation of your own vision, your dream and your passion. And that is really what this impressive customer list is. Once polymer based wallpaper can be bought at interior shops, would that not be amazing? Having all of your data and information literarily within your architecture is a piece of our vision. The notion of architectural computing is one of the core principals around which we have based our company. Today the way that pixels are displayed in our world is through screens, but for the very near future we already have seen display areas that are much more novel on fabric, wallpaper and so on. And once you have embedded your world with display services it is very important to understand where those services are in space, so than you can direct content to them. The real beauty of our system is that you can pick up an element from one part of your room and throw it to another part of your room. And once provided your tracking xyz space through our technology, than you can throw digital data between services. So imagine that in your house, you throwing digital stuff around your house…. 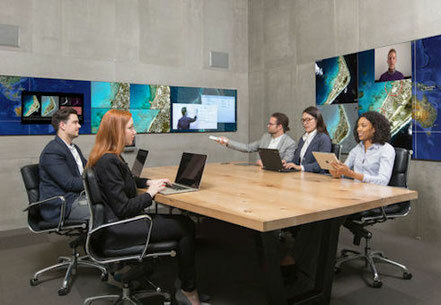 can we expect more cutting edge features from Oblong in the near future? Mezzanine is an evolution of ideas we have at Oblong. Mezzanine is not the end of the road, it is a longer path and that path is really ubiquity. It is ubiquity of ideas of spatial computing and the ideas that our computational world should conform to us, should live in the architecture of where we are everyday. We should be able to interact with our data in ways that are really human and also natural for us through voice, through gesture and so on....We bring transformative visions of companies to life.